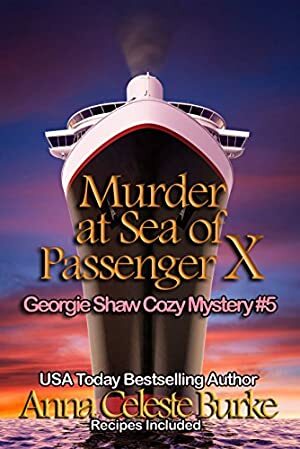 Georgie Shaw and her handsome new husband, Detective Jack Wheeler, are living it up on Marvelous Marley World's luxurious cruise ship when trouble strikes. "The screaming came in bursts followed by shouts of man overboard, just like in a movie." Who is passenger X? Did he fall or was he pushed? Does it have anything to do with the rash of jewelry thefts or the murdered man found near the spot where Passenger X went overboard? With a killer on the loose, Georgie and Jack are soon enlisted to help solve the case. It's a non-stop scramble to unravel the mystery before Georgie's eccentric boss, "Mad" Max Marley, arrives in Tahiti demanding answers. That won't be easy since Passenger X isn't the only one with a dubious identity as the list of suspects grows. That list includes Georgie's old friend Chef Gerard and his striking blond, blue-eyed Sous Chef, Paolo. Masters of five-star cuisine and wizards with chocolate, are they cooking up more than sumptuous feasts and banquets of desserts? How about the guy in the Perroquet suit or "Monster Marston," a standout in the fitness center? ??? "Ms Burke keeps the story moving with witty dialogue or descriptive action. A real mystery with a surprise ending. Be sure to get this book for a good read." Grab your copy of the latest Georgie Shaw cozy mystery from USA Today and Wall Street Journal bestselling author, Anna Celeste Burke! Log In to track Anna Celeste Burke on eReaderIQ. to be notified each time the price drops on any book by Anna Celeste Burke. to stop tracking Anna Celeste Burke. Log In to track Ying Cooper on eReaderIQ. to be notified each time the price drops on any book by Ying Cooper. to stop tracking Ying Cooper. We started tracking this book on February 10, 2017. The price of this book has changed 19 times in the past 798 days. The highest price to date was $4.99 last reached on April 11, 2019.